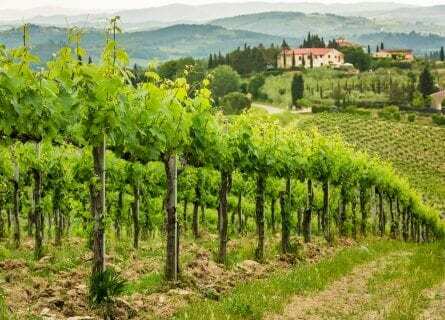 If you consider yourself a wine connoisseur or even a wine lover and you want to experience the best wine country experiences that Tuscany has to offer, then this is the Wine Tour for you! You will spend a week visiting the best appellations in this gorgeous part of Italy. 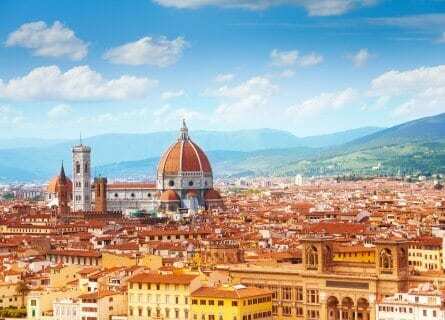 The tour begins and ends in Florence, and is a private chauffeured tour. You will spend your first night in Florence, home to Michelangelo, the Medici and some of the most beautiful architecture in the world. Dine at Cibreo, Florence’s hottest restaurants for Foodies. From Florence, you will travel through the scenic wine country of Chianti Classico, quintessential Tuscany. Cypress lined narrow roads and medieval hill topped wine villages are the classic images of Chianti, very photogenic. You will visit top producers such as Badia a Coltibuono (whose winery is one of the most beautiful in Italy). Next on this fantastic Tuscan wine tour is a visit to the exquisite Tuscan town of Siena, famed for its medieval Palio, the zebra-striped duomo and its “holy wine” (Vin Santo) served with cantucci. Enjoy a private guided tour with a local art guide, to gain a deeper appreciation of this beautiful town. From Siena, you will visit Montalcino and Montepulciano (to top Brunello di Montalcino and Vino Nobile di Montepulciano producers) and you will sleep in a luxurious castle located at the top of a hill with dramatic views of the valley beneath. From Montalcino, you will spend two nights in a luxurious villa in the wild Maremma, home to Italy’s famed “Super Tuscan Wines”. Savor amazing wines and enjoy some incredible meals in this lovely, quite undiscovered area of Tuscany. Your tour will conclude back in Florence, and you will leave Italy with many gourmet gifts and memories to last a lifetime. Your English speaking private chauffeur will meet you at the airport, and you will transfer to your very special boutique hotel, in the wonderful Piazza Santa Maria Novella, just a few steps from the Renaissance church bearing the same name. Welcome to Florence! Check into your luxurious hotel, a small mansion that resembles an art gallery. After you freshen up, your own private art guide will pick you up and you will discover the best highlights of Florence. After a welcome aperitif with your charming guide, enjoy a guided walking tour of Florence’s “Centro Storico” including the Mercato Centrale (the mind-boggling food market), the Piazza Della Signoria (the gorgeous square where the Uffizi gallery, Neptune’s fountain and the Palazzo Vecchio are all located), and plenty of hidden gourmet gems en route. The city’s cobblestone streets, lively atmosphere, and stunning artistic history all add to the enchanting atmosphere. Many writers and artist have been captivated by this city including, Henry James, Albert Camus, and Mark Twain. In the afternoon, sip a glass of wine on a stylish terrace or get in some shopping or sightseeing. Tonight’s dinner is a special treat- dinner at Cibreo. This restaurant is one of the favorite gourmet haunts in Italy. The New York Times described Fabio (Cibreo’s chef-owner) best when they said, “he talks like a poet and cooks like a wizard”. Fabio is definitely one of the best chefs in Florence, and indeed Italy, a maestro. Full breakfast in your sophisticated hotel. Today will be a wine tasting extravaganza! Your charming chauffeur guide will pick you up at your boutique hotel and you will transfer by Mercedes to the delicious Chianti Classico wine region, through the enchanting Chiantigiana route. This is the land of Sangiovese and you will taste different expressions of this noble grape. Begin with a visit to a historic estate such as the beautiful Badia a Coltibuono property, with its abbey and manicured gardens. On a private tour, explore the grounds and finish with a tasting of their best wines and even Balsamic Vinegar and Olive Oils. Carry on to Antinori’s Badia Passignano estate, our absolute favorite in Chianti. Your exuberant host will take you on a memorable tour of the property and you will taste some of Antinori’s mythical wines such as Tignanello, Cervaro Della Sala, Chianti Classico Riserva Badia a Passignano, Guado al Tasso, and Solaia. After the cellar visit, enjoy an Extra Virgin Olive Oil tasting followed by an outstanding lunch at the Michelin starred Osteria, with dishes paired with the aforementioned following wines. Top class. After lunch, you will carry on to the spectacular town of Siena. Your own personal art guide will meet you and take you on an “insider’s tour” of Siena. Walk off that lunch and discover some wonderful hidden corners of this charming town. After your tour of Siena, you will travel to your hotel for the next two nights- a hill-topped castle! Free evening to enjoy the hotel restaurant on your own. Full breakfast in the castle. Today, you will taste incredible Montalcino and Vino Nobile di Montepulciano wines! Your chauffeur guide will pick you up and take you first to Montalcino. This ancient village is best known for its elixir red Brunello di Montalcino wines, made with the Sangiovese Grosso grape varietal. Enjoy a VIP private visit to a Brunello producer such as the prestigious Nardi estate. 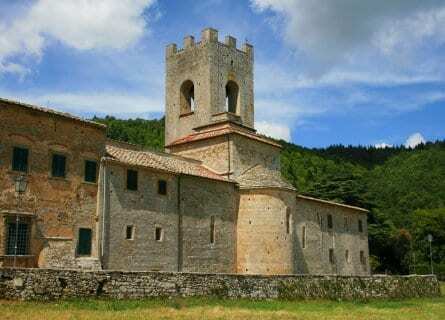 On the way to the winery, you can stop for a quick visit to the stunning ruins of the 9th century Abbazia di Sant’Antimo. 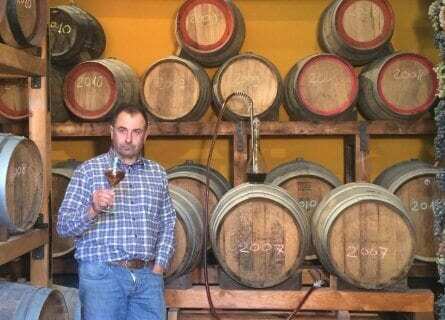 At the winery you will tour the barrel caves, the installations, take in the gorgeous views and taste Brunello “Riservas” and also Rosso di Montalcino. Lunch will be with your charming hosts at the winery itself in a private setting, intimate and special. After a delicious lunch, carry on to Montepulciano. Of Etruscan origin, Montepulciano is one of the most beautiful (and steepest) hill towns in Tuscany. The fortified hamlet was built along a narrow bridge made of natural tufa. Montepulciano is an absolute treat and of course a mythical name for wine lovers. Perfectly preserved and historic, there are darling enotecas (wine bars), gourmet shops and historic palaces, fabulous. The Vino Nobile wines of Montepulciano were the first to be given the ultimate quality level of DOCG certification. Which is why you are here! You will visit a top estate such as Valdpiatta or Avignonesi and enjoy a tasting of Vino Nobile wines. 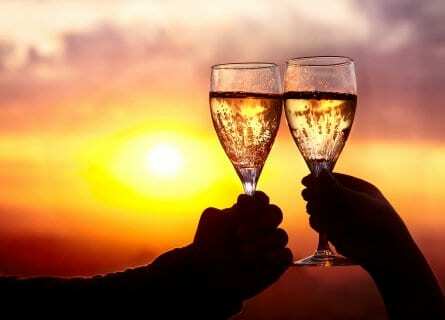 In the late afternoon, enjoy free time on your own in Montepulciano and transfer back to your winery resort. Full breakfast at your castle hotel. Today, you will travel southwest, from Montalcino to the mythical Maremma Wine Region. The drive takes you from the cypress-covered hills of Montalcino into the beautiful and wild Maremma region. The Maremma is one of the most interesting areas of Tuscany, and curiously “undiscovered” by non-Italians. It is more famous locally for its glamorous beaches on the Tyrrhenian sea, and millionaire’s yachts in Porto Argentario. It is also, interestingly, famous for its cowboys. The ‘butteri’ (cowboys) notoriously beat Buffalo Bill in 1911 when he challenged them to a contest of breaking in the colts. 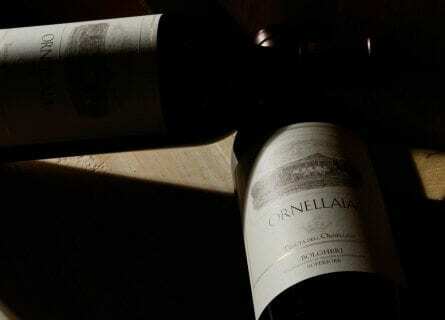 For us wine lovers, it is also the home of some of the biggest wine names in the world such as Ornellaia and Sassicaia. We will save the wine tasting for tomorrow to give you a chance today to soak up some culture. You will visit Montemerano, Pitigliano and other little villages before checking-in to your beautiful and villa hotel. Lunch in this gorgeous town called Italy’s “Little Jerusalem” for its Jewish heritage and ancient synagogue. Afternoon, sightseeing in wonderful little villages. In the evening you will arrive at your country villa style hotel, a delicious property. This is a five-star hotel that was once an aristocratic hunting lodge. It is certainly the most luxurious property in Southern Tuscany and you will love it! Alain Ducasse, France’s most famous chef, is the consultant chef here and he has created a Tuscan inspired creative menu, wonderful. This evening is free to enjoy the restaurant at the hotel. Full breakfast in your elegant Tuscan country hotel. Today is all about Super Tuscans! In the last 3 decades, there has been an explosion of tiny “garage” style wineries making some of the world’s best (and most expensive) wines. These days, the wines from Maremma can cost up to 500 dollars a bottle! You will enjoy a wonderful wine tasting day, taking in two superb cellars such as Petra (designed by the famed Mario Botta) and Ornellaia in the castle-crowned village of Bolgheri (one of the best cellars in Italy). After your wine “breakfast”, you will have one of the best meals on the tour- an unforgettable lunch at our favorite restaurant in the region, Ombrone. This converted 13th century “Frantoio” (olive oil mill) is fabulous. Your hosts are extremely charming and you will enjoy an olive oil tasting before your Tuscan style lunch. 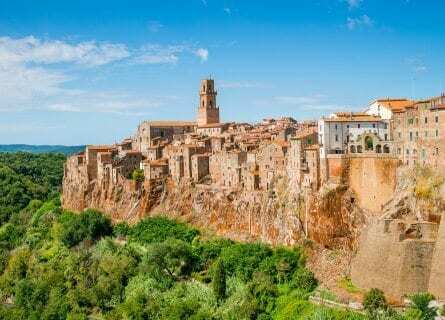 In the afternoon, your chauffeur guide will be on hand and you can visit the beaches of the Maremma, do some sightseeing in medieval villages or enjoy some time back to your ultra luxury little hotel. Full breakfast at an elegant hotel. Today you will enjoy an excursion to San Gimignano on the way back to Florence. San Gimignano is a gorgeous medieval village called “the Manhattan of Tuscany” because of its many towers (medieval, of course!). From the wild Maremma, you will drive northeast into the beautiful rolling hills covered in vines, olives, and historic villages. Stop in San Gimignano with your driver guide for a few hours. Take in the lovely cobblestoned streets lined with ristoranti, wine shops, ceramic shops. Visit the medieval palaces and art museums. Sit on a terrace before you leave, tasting the local white tipple, Vernaccia di San Gimignano. Upon arrival in Florence, you will stay in the same lovely boutique hotel as your first night. Enjoy the last night in Florence on your own, with a gift waiting for you in your room. We recommend Enoteca Pinchiorri for dinner if you want a famed Michelin starred chef or Alle Murate if you are looking for something charming and lively. Enjoy a lighter breakfast today as you will delight in a hearty Italian brunch later on this morning. You will travel west towards the hills of Ponte a Cappiano, a historic hamlet located on the ancient Via Francigena and sprinkled with olive groves. Your first experience of the day is a convivial and unique olive oil tasting at a top quality producer Poggio Cappiano. Enjoy a walk through the olive trees (magnificent in late autumn) and learn about Tuscany’s olive varietals and the process of making extra virgin oils. Finish the visit with a tasting of the full range of their premium olive oils as well as a delicious brunch of cured hams, local cheeses and of course- olives! Carry on towards the medieval hamlet of San Miniato, to the Beconcini wine estate, one of our favorite wineries in Italy. Your hosts will warmly welcome you to their small high-end estate, show you the vineyards, collect fossils along the way (the soil here is rich in ancient fossils), and you will conclude your terrific visit with some wine tasting and home cooked food in their family home. A very unique experience and a definite highlight of your wine tour in Tuscany. In the late afternoon, you can explore Pisa or head back into Florence. The evening is yours to relax and sip a glass of wine in a beautiful Florentine piazza. This concludes your wine tour of Tuscany, with wine tasting in Chianti, Montalcino, Montepulciano and the Maremma. You will leave with many gourmet goodies and gifts, and above all with a deeper appreciation of Tuscan wines, art, and architecture. We can arrange extra days in Rome or Venice, please contact us for details. Thank you so much for arranging the best vacation we've ever had! Everything was perfect; nothing went wrong. We loved Suaro and the guides were wonderful. Accommodations, food, and wine could not have been better. We will travel with you again! The overall organization of the trip was excellent. Everything worked, Stefano was always early or on time. There were no snafus for hotel reservations or restaurant reservations. Everyone was expecting us. The winery tastings and tours were well organized. I have already recommended cellar tours to several people in the week since I returned. Everything that was under your control worked. The choices of hotels were excellent but could have been better situated. You exceeded my expectations several times throughout the week. Wow!! We know how much work goes into planning this kind of trip. We appreciate your attention to the details. We can’t say enough how much we thoroughly enjoyed our trip. One of the wonderful things about our trip was once we had gone through the planning stage and had come up with an itinerary, our work was done. You made all the reservations for our accommodations, directing us to the “right” wineries, fabulous restaurants, and our Drivers Sauro and Stefano, who were wonderful, were always on time, took great care in calling ahead to let the wineries and restaurants know when we would be arriving, and drove very professionally on some very interesting roads!! For two people who always are in charge to be able to sit back and enjoy beautiful Tuscany and Verona was “magical!”. We came home rested and that is saying something after all the wineries we visited! The organization was great, and it flowed well. The accommodations were perfect for us, in terms of location and friendliness/helpfulness of the staff. Inn at Spanish Steps checked us in quite early and gave us breakfast. Meals were all AT LEAST very good. Some of them were memorable. Altesino served simple but fresh and delicious food that paired well with their wine. Even though it was served in the tasting room – or maybe BECAUSE it was served in the tasting room – the atmosphere enhanced the experience. The lunch at Sassicaia was delicious with good wine pairings. Roscioli – This was one of the most unusual dining experiences I’ve ever had. Incredibly fun and educational, too. Food was fresh and delicious (I will never be able to enjoy buffalo mozzarella in the U.S. again!). I wish I could go there with my tasting group once a month. Really great way to wrap up our visit.Il Palazzone winery in Montalcino- I had never even heard of them before. Glad you introduced us. Laura was a great hostess. Generously poured some older vintages that were not on the tasting. Nothing you could have done to make the trip more enjoyable. It was wonderful! Thanks again for everything, Gen!